I may have jumped the gun on this project a little bit. I assumed that since October hit I would be getting less from my garden (and mostly be preparing to rip it out and say a eulogy over the compost). That’s obviously not the case. 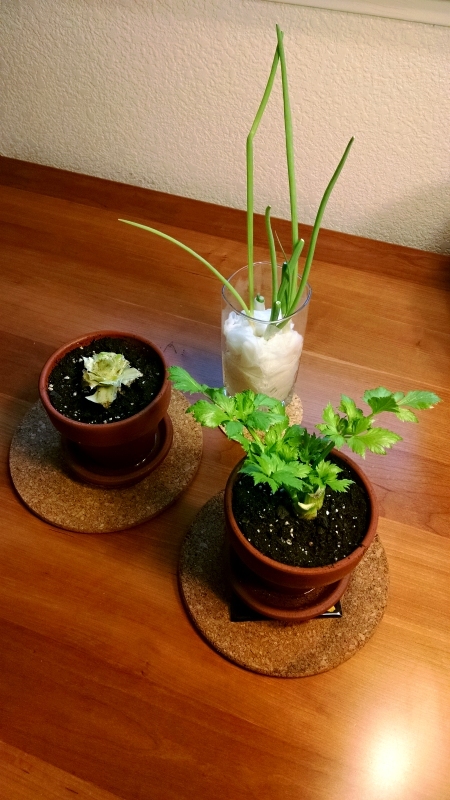 A few weeks ago, I read an article on regrowing kitchen scraps. It sounded fun and easy, so I gave it a try. I have a window that gets very good afternoon sun. From their bottom inch, I have regrown four green onions and have just started on a fifth. These I’ve just been doing in a glass filled with damp paper towels. My little pots contain celery (the leafy one on the right) and butter lettuce (the one that doesn’t appear to be doing much on the left). The celery I started from a cut down head, maybe 2.5 inches long. I planted another head outside to see if that soil would do better. I hear that squirrels like celery, so I don’t expect it to last very long. And maybe eventually someday the weather will turn cold. Possibly. The butter lettuce is from one of those “living lettuce heads” which, score, already comes with a root ball and some soil. You can’t see in that photo, and you would have to lean in very close to see in person, but there are a couple tiny little leaves forming. Do I think I’ll be able to make a salad eventually? Nah. Will I grow enough celery just to serve alongside buffalo chicken wings? Seems iffy. But it’s a fun little project, and I definitely will be able to use the green onions. Plus, I like being able to look over from the couch to my desk and see some greenery. It’s pleasant!